One day, early in 1989, Kirby Vining got a knock on his door. Two men, Tony Norman and Darryl Jordan, both residents of the Bloomingdale neighborhood, stood out front and asked “Do you know what the city is planning to do with that right over there?,” they asked, pointing toward the old water filtration plant which had been fenced off from the public since World War II. He didn’t. But he was curious. The two men spoke about the history of the park, about the people of the neighborhood that used to play there, and about the beautiful features that were still intact. As it turned out, the city was making plans to turn the old 25-acre site, McMillan Park, into a shopping center, with a K-Mart and other retail stores. The site had not been in use since 1986, when the Army Corp of Engineers, the land’s previous owners, updated to a newer water filtration system. No longer in need of the site’s towers or 20 underground caverns, the Engineers, in 1987, offered the city a deal: The land could be sold to the District for one dollar if it decided to keep the site as a park, or the city could pay $9.3 million if it chose to develop it. The city chose the latter. Vining was not prone to activism, but something about McMillan stuck with him. Resistance to the city’s plan was building. Some people within Bloomingdale thought that the site’s historical value should be preserved. McMillan was the city’s first water treatment plant, built in 1905, and played an important element in the city’s water supply system, preventing the spread of typhoid and other water-borne diseases. It was built as a part of the 1902 McMillan Plan, which, under the guidance of Michigan Senator James McMillan and the United States Park Commission, sought to finish the vision of architect Pierre L’Enfant by bringing in such prominent designers associated with the “City Beautiful” movement as planner Daniel Burnham, architect Charles McKim, landscape architect Fredrick Law Olmsted, Jr., and sculptor Augustus Saint Gaudens. The site also served as one of the first de facto racially-integrated parks in the District. Even today, over 60 years after the park was fenced off during World War II to protect the city’s water supply, if you stand at the center of its prominent vista, you’ll find a gorgeous view the National Basilica to the northeast, Howard University’s Independence Hall to the west, and the Capitol and Washington monument to the south. The site’s most prominent feature, the underground caverns where thousands of gallons of water were once stored, vary in condition from unusable to well-preserved. They are battered from 30 years of no maintenance, but some are arguably suitable for restoration and preservation. They are under any condition undeniably beautiful. And so the McMillan Park Committee was formed, a group of about 10-12 Bloomingdale residents, holding weekly meetings in Vining’s living room, hoping to maintain the site as a park and avoid having it turned into a suburban-like shopping complex. 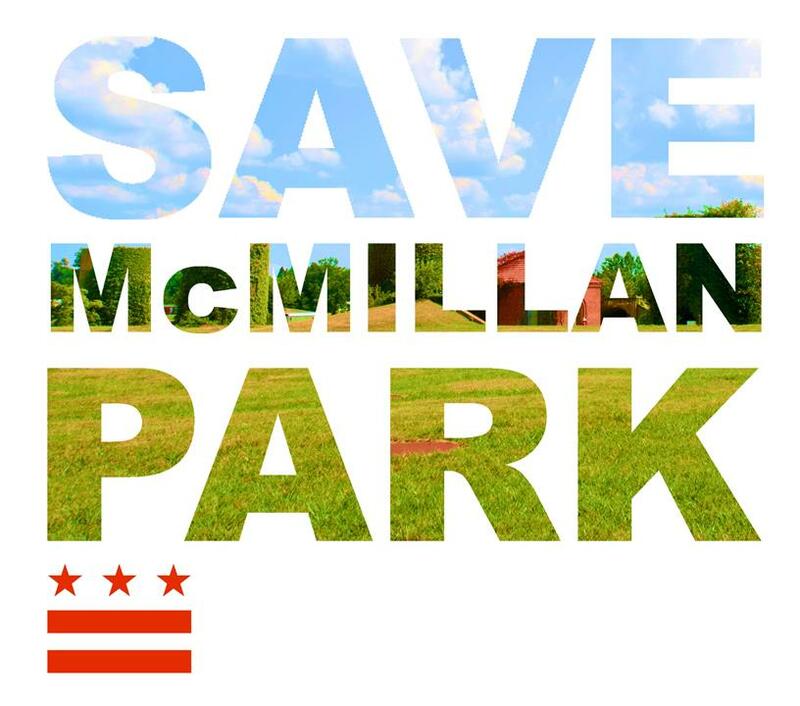 The committee won its first early battle when in 1991 the park was listed on the DC Inventory of Historic Sites. This new historic landmark status all but threw out the city’s plans to build the shopping center, and has hindered many proposed plans since. And just this year, the park was also listed on the National Register of Historic Places. Through the ‘90s, the park sat largely still, with only faint talk of development. In 2000, though, the city began to feel out ideas. It turned to the architectural departments at Howard and Catholic Universities, both of which sit less than a mile away from the park, to come up with a design. Catholic’s plan proposed that the majority of the above ground area remain open, with a small area of row houses built on the north end, an urban beach on the southeast end where the caverns were clearly irreparable, but with the majority of the development moved undergroundinto the remaining, usable caverns. Miriam Gusevich, a professor of architecture at Catholic who worked on the original design and has since proposed an updated version, remembers the response by the neighborhood to the plan. “There was a meeting where everyone came together and showed their ideas, and when people saw ours they got really excited,” she said. The city was skeptical, particularly that the caverns’ unreinforced concrete was structurally sound enough to permit their new, adaptive re-use. Gusevich denied this to be an issue. “The dome in the Pantheon of Rome is unreinforced concrete; it was built in 126 A.D and is still standing,” she said. She also argued there are tested products that can repair and add reinforcement to concrete installations at a low cost. Nevertheless, the plan soon fell by the wayside, and shortly after, the land was given to the National Capital Revitalization Corporation (NCRC), a development agency created by the city, in a land swap deal involving riverfront property along the Anacostia and the construction of the Nationals baseball stadium. By 2007, the city had dissolved the NCRC, reestablished control over the property, and quickly awarded the project to a team of developers, now known as Vision McMillan Park(VMP), to design new space for housing and retail on the site. When word of the Vision McMillan Partner’s design plan got out, out too, came the old bystanders from the McMillan Park Committee, who have since changed their name to the more descriptive Friends of McMillan Park. Along with Kirby Vining, Tony Norman, Darryl Jordan, and the rest, came an ever-enlarging group. Today, in addition to the hundreds of people who subscribe to their list-serve, Friends of McMillan Park has upwards of 20 of its members who do the group’s day-to-day work. They have held numerous town hall meetings, posted flyers, and even built a website — all to bring awareness to their cause. Hugh Youngblood, an environmental engineer who served as an advisory neighborhood commissioner from between 2011 and 2012, was brought in by other commissioners in the neighborhood. “They would all talk about this place, and what they wanted to do to it, and I knew I had to get involved,” he says. Professor Miriam Gusevich of Catholic University’s architecture department has updated her original plan and it has largely been adopted by the Friends as their vision for the park. In it remains the small portion of housing and retail on the north side, the urban beach, and development underneath in the caverns. Added now is an ambitious underground community center which would include a swimming pool, wading pools, tennis and basketball courts, among other facilities. In the past few months, the Friends have collected nearly 6,000 signatures on a petition asking that the city at least consider its alternative plan, but to this point there has been no response. At the very least, most of the Friends are flexible in what they want for the site so long as it’s historical features are left intact. The wrong kind would be the Vision McMillan Partners (VMP) plan, which would demolish the majority of the underground caverns in order to build town homes, an apartment building, a grocery store and other retail space. To be fair, VMP, which has brought its plan before the Historic Preservation Board several times since it was awarded the site in 2007, though so far has failed to meet the board’s requirements, has made what seems to be a good faith effort to adjust its plans. From its original plan, VMP has increased the size of the park, restored the Olmsted Walk on the outer border, added a recreation/community center, a garden, and water features. Indeed, the Friends have not conducted studies on either their plan’s cost nor feasibility. This omission could be the largest hindrance to potential for development. The writer, Mike Persley, a resident of the Bloomingdale neighborhood, is a graduate of the University of Illinois at Chicago where he majored in political science, and is now studying for his Masters degree at the University of Maryland’s Phillip Merrill College of Journalism.